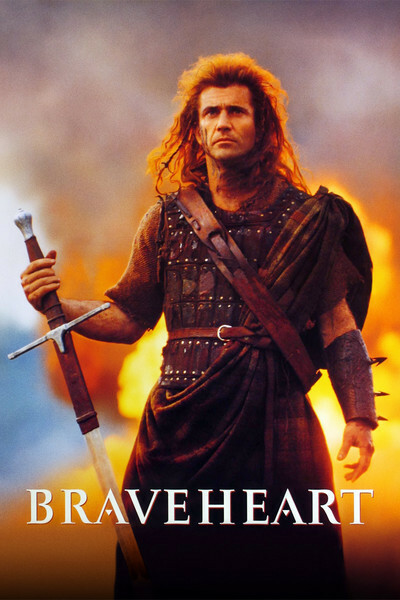 Mel Gibson's "Braveheart" is a full-throated, red-blooded battle epic about William Wallace, the legendary Scots warrior who led his nation into battle against the English in the years around 1300. It's an ambitious film, big on simple emotions like love, patriotism and treachery, and avoids the travelogue style of so many historical swashbucklers: Its locations look green, wet, vast, muddy and rugged. Not much is known about Wallace, known as Braveheart, except that according to an old epic poem, he unified the clans of Scotland and won famous battles against the English before being captured, tortured and executed as a traitor. Wallace's dying cry, as his body was stretched on the rack, was "freedom!" That isn't exactly based on fact (the concept of personal freedom was a concept not much celebrated in 1300), but it doesn't stop Gibson from making it his dying cry. It fits in with the whole glorious sweep of "Braveheart," which is an action epic with the spirit of the Hollywood swordplay classics and the grungy ferocity of "The Road Warrior." What people are going to remember from the film are the battle scenes, which are frequent, bloody and violent. Just from a technical point of view, "Braveheart" does a brilliant job of massing men and horses for large-scale warfare on film. Gibson deploys what look like thousands of men on horseback, as well as foot soldiers, archers and dirty tricks specialists, and yet his battle sequences don't turn into confusing crowd scenes: We understand the strategy, and we enjoy the tactics even while we're doubting some of them (did 14th century Scots really set battlefields aflame?). Gibson is not filming history here, but myth. William Wallace may have been a real person, but "Braveheart" owes more to Prince Valiant, Rob Roy and Mad Max. Once we understand that this is not a solemn historical reconstruction (and that happens pretty fast), we accept dialogue that might otherwise have an uncannily modern tone, as when Braveheart issues his victory ultimatum to the English: "Scotland's terms are that your commander present himself in front of our army, put his head between his legs and kiss his - - -." Uh, huh. In the film, Wallace's chief antagonist is King Edward I ("Longshanks"), played by Patrick McGoohan with sly cunning; he is constantly giving his realpolitik interpretation of events, and that's all the more amusing since he's usually guessing wrong. Edward's son, the Prince of Wales (Peter Hanly), is an effete fop who marries a French woman only for political reasons. "I may have to conceive the child myself!" Longshanks says, and indeed, under the medieval concept of prima nocte, or "first night," nobles were allowed a first chance to sleep with the wives of their lessers. The Princess, played by the French actress Sophie Marceau, does not much admire her husband, who spends most of his time hanging about moon-eyed with his best friend (until the king, in a fit of impatience, hurls the friend out the castle window). Edward, smarting from defeats, dispatches the Princess to offer his terms to Braveheart, but soon she's spilling all the state secrets, "because of the way you look at me." The Princess is the second love in Wallace's life; the first, his childhood sweetheart Murron (Catherine McCormack), marries him in secret (so the local English lord won't claim his rights). The two spend their wedding night outdoors, and the backlit shot as they embrace gains something, I think, from the frost on their breaths. These characters come from hardened stock. (When Wallace has a reunion with his childhood pal Hamish, they hurl rocks at each other for entertainment; later, when a Scotsman has his wound cauterized, all he says is, "That'll wake you up in the morning, boy!") It is sometimes seen as an egotistical gesture when actors direct themselves, especially in heroic epics costing (so they say) $53 million. The truth is, given this material, I do not know that anyone could have directed it better. Gibson marshals his armies of extras, his stunt men and his special effects, and creates a fictional world that is entertaining, and thrilling. And as Braveheart, Gibson plays his role with flamboyance, and cuts it with sly humor. He is an amazing battlefield strategist, inventing new strategies and weapons, outsmarting the English at every turn, leading his men into battle with his face painted blue, like a football fan. There is a scene where he is so pumped up with the scent of battle that his nostrils flare; not many actors could get away with that, but Gibson can.